Maslenitsa is also famous for being Russian pancake week. This is of course no surprise as Maslenitsa and blini are just inseparable. Celebrating Maslenitsa with blini is also a rule nobody can break. Well, imagine celebrating Christmas without all the carols. That is what Maslenitsa would be like without blini. Find out more about why celebrating Maslenitsa with blini is just simply inevitable. First thing first is of course because blini symbolises the sun in Maslenitsa. 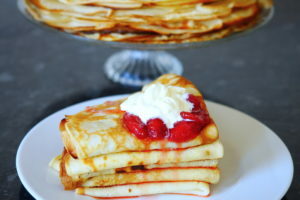 Russian believe that the pancakes embody a little bit of the sun’s warmth and positive energy. The interesting thing is, blini used to be made out of buckwheat flour. The ingredient lent the pancakes its red color, which made blini resemble the sun even more. During the holiday, Russian usually try to eat as many as they can. As the old Russian saying goes “eat as many times as the dog wags its tail”. But there is actually more to it. Circle is a sacred symbol in Russian tradition. Russian believe that circle protects them from evil and any foul intentions. Russian celebrate Maslenitsa as a symbol of saying good bye to the cold winter days. It also symbolises the welcoming of the warm and lively spring. Ancient Russian tradition has it that women have to make as many blini as possible. They believe that if a woman prepares loads of blini, her family would see a season of fruitful harvest, good health and of course, success. The week-long celebration of the pancake week starts on the Maslenitsa Monday. While kids and adults alike are busy building the Maslenitsa effigy, women will be busy in the kitchen. Celebrating Maslenitsa with blini means they will be busy preparing batches of pancakes. The noble value behind it is Maslenitsa has also become a time for people to give back. They will serve the first pancakes to the less fortunate. Celebrating Maslenitsa with blini has deeper meaning than just a feast during a festive season. Russian believe that when spring time is approaching, the world between the dead and living also come closer. Before Maslenitsa turned into a week of joy and fun, they used to cook blini as offerings to the ancestors. They also believed during this time the ancestors would visit them. The thin shape of blini symbolised the thin barrier between the two worlds. Yes, you read it right. Russian make and eat fresh blini during the celebration. This is because they believe eating the pancakes symbolises eating the sun. As they consume the pancakes, they also consume the warmth and energy the sun emits. Celebrating Maslenitsa with blini has just got better and better. Russian not get creative with their favourite feast. They now eat blini with different toppings. Some of the popular choices are caviar, cream cheese, and syrup. During the week, there are tents selling blini with the various toppings. This is a must have if you visit Russia during Maslenitsa. Before Maslenitsa become a part of Orthodox Christian holiday, it was a pagan tradition. There are several speculations about the original celebration of the holiday. One of the popular one is Maslenitsa being ‘Komoyeditsa’ back then. The pagan name of the butter week according to the belief is ‘Komoyeditsa’. They believed that when winter was ending, bear, which was the king master of the jungle would wake up from their long sleep. The bear would wake up hungry after their hibernation. People then would bake the pancakes and bring it to the forest to feed the bear. In ancient Russian tradition, bear was referred to as ‘Kom’. This is why, some people interpret Komoyeditsa as ‘feeding the bears’. Celebrating Maslenitsa with blini holds yet another special meaning. Russian celebrate Maslenitsa on the last week before the Great Lent. For those who didn’t know, the Great Lent is the seven-week long fasting before the Orthodox Easter. During the fasting period, Orthodox Russian omit meat, fish and dairy products from their meal. Those products are considered as worldly. Another thing Orthodox Russian have to avoid during the Lenten fast is festivity. They can not take part in any kind of secular music, party, and dancing. That is why, celebrating Maslenitsa with blini also serves as the last celebration and fun before the fasting. It is also the last where they can spoil themselves with dairy products. If you are planning to visit Russia, Maslenitsa is one of the perfect occasions to be there. There are also other big celebrations like the Russia’s victory day. You can also be there for Christmas and see how Russian celebrate the holiday. Or if you are interested in visiting Russia to pursue higher education, these cities are not to be missed.